The timeless Tiffany Somerset Ring in sterling silver costs $250 at tiffany.com. A great holiday gift for that special someone! 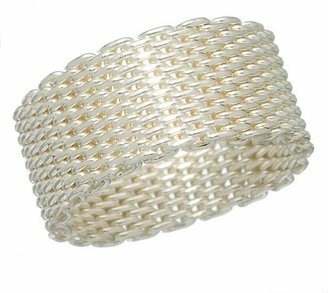 If you want this look for yourself, try this Silver-Tone Mesh Ring from kohls.com instead, now on sale for just $5.99. Click the image to purchase. I'm actually using my bonus money from work to get a necklace from Tiffany's. A little splurge for myself.